A comprehensive inventory was completed for the Nicola River in November 2016 from Nicola Lake downstream to the Thompson River confluence for completion of an Aquatic Habitat Index (AHI). The AHI is based on various criteria, such as biophysical, fisheries values and anthropocentric characteristics to estimate the relative habitat value of river reaches and bank segments defined during the inventory. Two maps are also available. 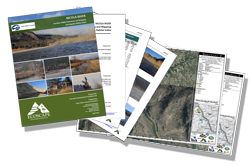 These are very large files and available to download from FBC's HighTail space Nicola Watershed Maps.